I wrote this article in 2002/2003 which was posted at the time on my online ministry site. It is not up and running at this time, though I consider from time to time to restart it. I share the article here because it was so powerful to me at the time. 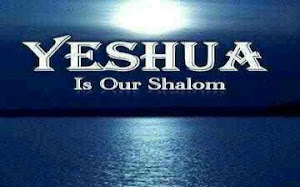 It was the first time it was revealed to me that the ENTIRE word testifies of our Messiah, Yeshua. It was the first time I had let God lead my study of His word. It was amazing. Four weeks ago I taught my Sunday School class about Noah's ark. We read the scriptures and made an ark and animals, and talked about how Noah must have felt being on that Ark, and about how the people outside of the Ark felt and about how God felt. They were excited about all the animals that came to the Ark. They were interested that Noah did what he was told to do with no evidence that a horrible disaster was coming except a whispered word. But when I told them that God killed everyone outside the Ark, they were a little distressed. "Everyone?" they said to me. "Everyone." I knew how they felt. It was so sudden it seemed, Noah built a Ark, got on, and everyone else died. I went home. I read it again, and again, and again. I prayed about it often, and lay in bed thinking about it. I was missing something. But what. 7 So the LORD said, "I will wipe mankind, whom I have created, from the face of the earth--men and animals, and creatures that move along the ground, and birds of the air--for I am grieved that I have made them." 18 But I will establish my covenant with you, and you will enter the ark--you and your sons and your wife and your sons' wives with you. I had found what I had been missing. In my Sunday School class we had read this, but I had not noticed it and I doubted my children did either. There was no rain for seven days. Noah sat in the ark for seven days waiting for it to rain. And the people outside the Ark had seven days to change their minds. The people outside the ark: they did not worship God, or acknowledge Him, they did not live by His laws and commandments, but "sought to do evil continually." They had hard hearts and they thought Noah was crazy for building his big Ark with no clouds in the sky. But they had also witnessed an amazing thing. As the Ark was near completion, a great caravan of animals came, peacefully, of their own accord, walking to Noah's home to get on an Ark. God had given these animals wisdom, making them peaceful and unafraid, to go to the Ark and get in it and be saved. The people outside the Ark saw this great sign and still turned away. Noah got on the Ark and waited, I think somewhat impatiently, asking God, "How long? You said you would make it rain. You said you would destroy this evil generation. How long before you do?" And after seven days the floodwaters came on the earth. So the next Sunday also, I taught about Noah's Ark, and the seven days that the people had the choice to be saved also. They did not, but they had the choice. But still I was missing something. This story, about a man long dead, held something more than I could not comprehend. Something more, why was it in the bible at all? Why did God choose this story to tell about Him, His salvation, His promise of a Redeemer? I prayed and read and prayed and read. Then one morning, early, when every one else was sleeping, I found myself wide awake wondering about it. I prayed. "God, What am I missing. I sense that there is something very important. What is it?" It seemed that the seven days held great meaning. What happened during those seven days? It says that the people were eating and drinking and marrying as before, doing their evil continually, laughing at crazy Noah. And the animals were all in the ark, waiting, knowing that God had sent them there to be saved. And Noah? Noah was asking God, "How long?" How long will the wicked, O LORD, how long will the wicked be jubilant? Then I said, "For how long, O Lord?" And he answered: "Until the cities lie ruined and without inhabitant, until the houses are left deserted and the fields ruined and ravaged"
That last scripture is from the chapters of Tribulation in the Bible. The seven days were the seven years of tribulation, when evil reigned on earth unhindered by the hand of God. The ark represented the Ark of the Covenant, which represented the Covenant that we are saved by, Jesus Christ. And those who entered it were saved, Noah, his family, the animals, all those who rested in the promised Redeemer. They entered in the covenant and God closed the door. And for seven days God waited. Why? He did not want any to be destroyed. So, giving them every possible chance to follow him, he made signs, in heaven and earth for them to see, but they did not turn His way. Noah getting on the Ark is representing the Rapture. And finally, the flood is representing Jesus' great army which is coming after the tribulation to destroy all evil and to bind Satan for a time as has been written. That was what I had been missing. Right there, before me, in a story for children, of a past we do not remember and many doubt existed at all, was the pattern of salvation. And here too, evidence of the promised wrath of Revelations, that many deny will happen, and many more have never heard. Last Sunday I taught my children in my class. I said, "Forgive me, but I must speak about Noah's Ark one more time." I sensed their disappointment. But I knew that if they understood what I had learned they had that much better of a chance to be on that Ark when it came time. They want to be in Jesus. And if I, their Sunday School Teacher, never tell them how to be there, that is one missed blessing for me, and many missed blessings for them, and possible blood debt on my part which I do not take lightly. So I taught them again on Noah's Ark. I told them about the Rapture, the Tribulation, and the End. And I told them about the Ark, the Ark of the Covenant, the Covenant, and Jesus Christ. I told them that those who follow Jesus are saved. And I told them that they must accept Jesus to be saved by Him. And I told them about following him, walking the walk. I told them that I did not believe works were necessary for salvation, that we were not saved by doing good deeds, but only by faith. But I also told them what we have to gain by following Him completely and doing His will. And I told them what we have to lose when we do things our own way. Not our salvation, for that is securely promised, but blessings, and peace, and joy. This was a very hard subject. And as I spoke they got more and more quiet, stopping their whispered conversations, laying down the markers they were coloring with and looking at me seriously. They asked me what they had to do to be saved, seriously. And I told them. I had always held back, thinking they were too young to understand, but as I spoke to those 6 and 7 year olds, last Sunday, they looked at me and told me they had never heard this before and would seriously consider it and think about it and remember it forever. We prayed, not the prayer of salvation because that is a personal choice and must be to be real, but a prayer for wisdom and blessing, and protection. The moment passed, but I cannot forget Hailey's eyes looking back at mine, astonished that Jesus was our Ark and we could be saved by entering in. And I remember Britney's face as she began to understand the blessings we can have, and the blessings we can lose, by our walk. They understood, and they were glad I had told them. No longer disappointed but seriously thinking about the Kingdom and considering their own citizenship in it. I believe that it was my greatest Sunday School Class. It lasted only a short time, after which we played games and colored a picture with flowers and a cross that said JESUS LOVES ME. But that didn't negate the power of that message. And I am blessed, because it was not mine, but given to me also. For those of you who read this, I must say that Jesus does Love You. And I must say that His promise is for you, and for your children and as many as God may call. May God richly bless you, brethren in Christ.